ROK's Compatriots Abroad Act: "nationals abroad" and "alien nationality compatriots"
In 1909, when Japan's Residency-General of Korea pushed Korea to adopt and enforce a comprehensive Population Register Law, Japan had fully 37 years of experience with the use of family registers to secure the control, of local governments and in turn the state, over the affairs that governments need to attend to as agents of their affiliated populations. What Japan sought to do in Korea was essentially the same as it had already done in Japan -- which by 1909 included Taiwan and Karafuto, where population registration had also been essential to the bureaucratic overseeing of government affairs. The importance in family registers to Japan's nationalization of its sovereign dominion, and the capability of its national and local governments to oversee all matters that concern governments, cannot be overstressed. That the family registration system was at times vulnerable to abuse by some officials and others is true, but similar abuse of public records can be found in every country, including (if not particularly) countries like the United States, where in some ways there has been more bureaucratic overseeing of private affairs, and less privacy, than in Japan. Populations are controlled in many ways for a variety of reasons. Local and national authorities are motivated to organize and oversee land distribution and usage, roads and waterways, water and fuel supplies, sewage and waste, irrigation, food production, animal breeding, markets and trade, taxes, and labor and military conscription. The list of government concerns continues with education, all matter of health and welfare matters, elections, legislation, law enforcement, public safety and national defense, natural disaster relief, sometimes also religious and cultural affairs, and relations with other entities and governments. The list could on and on, and would differ for every country, at every period in the country's political and social history. As Japan entered the 20th century, it had unquestioned faith in its achievements. In the span of barely three decades, it had built a state that had proven capable of competing with the Euroamerican powers with which, until 1899, it had been leashed by extraterritorial treaties. Still leashed, it was victorious over China in the Sino-Japanese War of 1894-1895. Unleashed, it defeated Russia in the Russo-Japanese war of 1904-1905. Both wars began in, and were essentially about, Korea and who would have the most say in its affairs. All annual reports published by Japan's Residency-General of Korea during its tenure from 1907-1910 when Korea was a protectorate of Japan, and all early reports of the Government-General of Chosen that replaced it when Japan annexed Korea as Chosen in 1910, go into great detail about the failure of registration practices on the Korean peninsula, especially their susceptibility to abuse and corruption. The governments of Chosŏ (Yi dynasty) and its successor, the Empire of Korea, attempted to improve registration practices. But attitudes of officials and others toward registration served the vested interests of fusty clans and powerful classes, rather than the proper functions of a state that aimed to develop and protect its nation of people. Korea had its own population registers and standards for keeping track of who was related to whom, and for knowing who resided where, and what land they owned, and what taxes they owed. However, practices were not uniform. Generally, registers were kept by heads of households and were mostly concerned with documenting male lineage. Wives were not necessarily included, and not everyone had a surname. Korea's household registration system at the end of the 19th century may have been less developed, as a tool for social organization and control, than the parish registration system Japan replaced in 1871 with a comprehensive, nationwide system under local government control. By the time had become a protectorate of Japan, during and immediately after the Russo-Japanese War of 1904-1905, Japan had mastered the use of population registers as a tool of social control in its nationalization of older and newer territories. As a result of agreements a 1904 defense agreement and a 1905 diplomacy agreement, the Empire of Korea became a protectorate of the Empire of Japan with respect to its national defense and foreign affairs. In 1907, the Korea and Japan also signed an agreement which gave the Residency-General of Korea, Japan's protectorate government on the peninsula, the authority to oversee some of Korea's domestic administrative affairs and reforms. The scope of the 1907 agreement gave Japan the authority to approve laws, ordinances, and administrative measures, recommend Japanese for appointments to posts within the Korean government, and approve retainments of foreigners, among other powers that amounted to significant control of Korea's domestic affairs. Under the direction of the Residency-General, the Empire of Korea promulgated and enforced a population registration law and issued enforcement regulations. The purpose of these measures was to improving the quality of demographic information for the purpose of collecting taxes and administering other laws and policies concerning individuals and families. This law, initiated and shaped by the Residency-General of Korea, which was overseeing many of Korea's affairs, sought to increase the precision of demographic information for the purpose of collecting taxes and introducing other administrative reforms of the kind Japan had implemented during the early years of Meiji Period. On 4 March 1909, a year and a half before before its annexation to Japan, the Empire of Korea adopted, under Japanese guidance, the Population Register Law (民籍法 민적법 Minjŏkpŏp J. Minsekihō). The law, which into effect from 1 April 1909, was administered under enforcement regulations issued on 22 March 1909 by Korea's Interior [Affairs] Department. Provincial police departments, sub-provincial precincts, and local police stations with precincts were responsible for registration matters. The 1909 Population Register Law was essentially a list of personal and family status matters that were to be reported to local registrars for recording in local population registers, and provisions for who was responsible declaring declarations, where and how declarations were to be made, and punishments for failing to report and for making fraudulent reports. Enforcement regulations stipulated which authorities had jurisdiction and responsibility for registration matters, and procedures. Police in Korea were under Korea's Interior Department, just as police in Japan were under Japan's Interior Affairs Ministry. Their involvement in population registration was not inconsistent with the scope of police duties, which embraced a number of functions that are not related to "law enforcement" in the narrower sense of preventing and solving crimes. All manner of journalistic woodblock prints depicting and narrating true incidents in Japan during the 1870s, for example, show police protecting protecting people not only from others who might harm them or their property, but also from self-harm, as in suicide prevention (see the News Nishikie website for several examples. Karel van Wolferen, in his chapter on Japan's police in The Enigma of Japanese Power, called them the "nurses of the people" -- by which he meant they were "nannies, monitors and missionaries" -- and he characterized imperial Japan as a "friendly neighbourhood police state" -- (van Wolferen 1992, Chapter 7, pages 181-201, Chapter 7). Shortly after the new law came into effect, the police advisory board corrected a 1907 count of households and inhabitants with information current as of 15 June 1909 (see figures below). Between July 1909 and April 1910, again before the annexation of Korea as Chosen, Korean police, assisted by Japanese gendarmes, established uniform registers throughout the country in accordance with the new law. The new registers included wives, and everyone had a surname. The registers still reflected patriarchal and primogenitural family standards but now, in principle, also recorded the existence and status of all individuals in a household. In 1909, when Japan pressured Korea to adopt Japan's highly disciplined approach to building a foundation of government on population registration, Japan was already surpassed most of its rival Euroamerican status in their ability to compile social statistics in order to facilitate their governmental missions. In the United States, which was just then completing its sea-to-shining sea continental Union, and stretching its muscles into Pacific territories like Hawaii and the Philippines, record keeping varied considerably from state to state, and territory to territory, as each was a jurisdiction unto itself, and there were few national standards. Japan was territorially much smaller and legally less complex than the United States, and arguably it was much more easily managed as a single nation. Only a few European states, such as Sweden and France, were capable of compiling the volumes of nationwide population and other social statistics that were, by second decade of the 20th century, taken for granted in Japan. There is a tendency, among especially Americans and others not familiar with family register practices in Japan, but also among some Japanese, to associate Japan's registration practices with Draconian social control by the state. Such criticism rarely considers the advantages of family-based registers. In the United States, say, records of birth, death, marriage, divorce, property transactions, and all manner of other matters are mandatory under state and territorial laws and county ordinances. With its legal jurisdictions and lack of interstate standards (though such standards have been evolving), dealing with matters of inheritance, in which family heirs are scattered across the nation, can be a true challenge for an attorney who has to handle a probate or estate. But still, in the United States, one needs to register locally in order to vote in federal, state, district, or municipal elections. And one needs a Social Security Number to do this. Historically, Social Security registration was mandated by laws related to employment, taxation, and military service. Today, though, parents are supposed to obtain a SSN for their children when born. And SSNs are increasingly used as master ID keys on all manner of public and private records. The numbers are not usually shown on official documents, but they will be recorded for database and other purposes. For many decades in the last half of the 20th century, Japanese critics viewed US-style Social Security Numbers as a tool for the state to invade privacy, including privacy in financial affairs. Japanese balked at the adoption of a similar system for Japan. Today in Japan, local family registers are tied together in a nationwide database. A number of local polities at first refused to participate, but now all holdouts have permitted their registers to be included. Many national programs, facilitated through municipal or regional offices, including national health and pension insurance schemes, require linking with registers as primary records of legal existence and status. The lack of a common ID number has greatly encumbered the ability of administrative organizations to rationalize their operations, both to save operating costs, but to eliminate problems such as the inability to collate records of individuals who have migrated to another register or change their jobs or name. The National Tax Agency, which also facilitates the collection of local taxes, would also like a common ID number to improve its efficient, and to reduce tax evasion and manipulation of bank accounts and other financial matters involving the use of aliases or forms of false identity. In other words, there is in Japan today -- as there is in many other countries -- an increasing appreciation of the value of nationwide standards in basic civil records, and the need, in the computer age, for a personal ID number that facilitates not only a host of government services -- but also protection from identity theft. In Japan, all manner of services -- including public school enrollment, voting, national health and pension, public assistance and other forms of welfare, national and local taxes, passports and driver licences, and a host of other matters that are essential to organized life -- are facilitated by municipal registration -- family and resident registration for Japanese, and alien registration for non-Japanese residents. Legal existence is a matter of being known in accordance with provisions of law. In Japan, one exists as an artifact of registration. Birth constitutes an event that does not exist until a birth certificate is filed and duly accepted by entry on a birth roll. A newborn child acquires status as either a Japanese or alien. Children qualified for Japanese nationality will be entered in a Japanese family register. Those not qualified for Japanese nationality will be entered in an alien register. Under Japanese law, such statuses have always been based on family law, which includes right-of-blood rules involving paternal or maternal lineage, as well as on right-of-relationship rules in which status is derived through marriage or adoption, but also place-of-birth or place-of-discovery rules rules that apply when finding an abandoned child of unknown parentage or nativity. The same was essentially true for determinations of legal existence in the Empire of Korea at the time Japan annexed Korea as Chosen. There were no provisions for considerations of "race" or "ethnicity" in determining who qualified for entry in a population register. As legal statuses, being Korean and then Chosenese were civil, not racioethnic or ethnonational. On 17 August 1899, a few months after Japan adopted its first Nationality Law, the Empire of Korea promulgated the "System of Great Korea" (大韓國制 대한국제 Tae Hanguk je). The fourth of the nine articles in this constitution of sorts outlined the duties of "Great Korea subjects" (大韓國臣民 대한국 신민 Tae Hanguk sinmin). But none of the articles defined the Korea's subjects or touched upon the topic of nationality. Nor did Japan, when it annexed Korea on 22 August 1910, formally extend its nationality law to the peninsula. Since Korean nationality had been customarily defined, and because there were no stipulations about nationality in the annexation treaty, Japan assumed that the people who came with the territory of Korea would be subjects of Japan. In the renaming of Korea as Chosen, Koreans became Chosenese. And as Chosen was part of Japan, Chosenese naturally became Japanese subjects and nationals. Neither Chosŏ under the Yi dynasty, nor the Empire of Korea, had a nationality law. In earlier treaties in Chinese, and in later treaties in Sino-Korean, Sinific expressions meaning "affiliation" (属) were translated into English as "nationality". Persons considered "affiliated" with Chosŏ or the Empire of Korea were "subjects" of these entities. In customary practice, then, "nationality" was simply a matter of affiliation, and affiliation was a matter of being considered an inhabitant of the peninsula. Inhabitants were those with family ties to the native population. And as more and more, and finally most if not all inhabitants came to be formally enrolled in local population registers, enrollment in a register -- as someone with a "principle register" (本籍) in a peninsular jurisdiction -- came to be proof of being an affiliated inhabitant, hence subject, hence a national, hence a possessor of nationality. This was also true in Japan, which did not have a formal nationality law until 1899. China, under the Ching (Qing) dynasty, did not have formal nationality rules until 1909 -- and their main affiliation principles were based on Japan's 1899 law. China even adopted the term coined in Japan to mean "nationality" (國籍). Not having a nationality law before 1899 did not prevent Japan from determining who was a subject. Subjects were people in Japan's affiliated household registers. And qualifications for entering and removal from such registers were governed by family law. In fact, Japan had issued passports -- transit permits authorizing travel outside Japan, which served as identification documents when entering a foreign country -- as early as 1866, two years before the transition from the Tokugawa to Meiji governments. By 1878, the imperial government of Japan was issuing formal passport that complied with passport standards in a number of other countries. In other words, a state does not need formal nationality laws to determine who it wishes to recognize as an affiliate of its demographic nation -- subject, national, or citizen. Japan's 1899 Nationality Law did not, in any event, declare who was considered to already be Japanese. Japanese were already Japanese. Similarly, Taiwanese and Karafutoans were already Japanese when Japan applied its nationality law to these two territories in respectively 1899 and 1924. Japan's Nationality Law merely codified rules which, for decades and even centuries, had determined who qualified for entry in a family register affiliated with a locality in Japan's jurisdiction. What was new about the law was its provisions for naturalization, and other auxiliary rules for gaining, losing, and recovering status as Japanese other than at time of birth -- and rules which restricted naturalized persons from holding higher political and military posts. The 1909 Population Register Law continued to operate, in conjunction with statue and customary family law, to determine who qualified for status in a Chosen "principle register" (honseki). And status in such a register continued to determine who was "Chosenese". Since Chosen was part of Japan's sovereign dominion, it stood to reason that Chosenese were subjects of Japan, and as subjects of they Japan they were obviously its nationals, and as its nationals they were obviously Japan. I say "obviously" because that is how such status matters would be customary regarded -- without the need for a specific law to spell out the "obvious" consequences of Korea having become Chosen. Like registers in the prefectures of the Interior, and in Taiwan and Karafuto, registers in Chosen defined the population that constituted the subnational territory of Chosen within the greater Japanese nation. Anyone in a Chosen register was Japanese by nationality and Chosenese by subnationality. The term "minseki" (民籍) was an older Chinese term for population (affiliate) registration. The term had also been used in Japan long before it was pressed into service in the 1909 Korean law. The expression "jinmin koseki" (人民戸籍) or "peoples household registration" was used in the 1872 Family Register Law as promulgated in 1871. "Minseki" is essentially an abbreviation of this expression, which means "registers of people affiliated with a polity". During the 1930s, Japan published national census figures in terms of "minseki kokuseki betsu jinkō" (民籍国籍別人口) meaning "Population by minseki/kokuseki" -- in which the terms "minseki" (民籍) and "kokuseki" (国籍) were conflated. "Minseki" embraced Interiorites (内地人 Naichijin) and Exteriorites (外地人 Gaichijin), and Exteriorites were broken down by Chōsen (朝鮮), Taiwan (台湾), and Karafuto (樺太 (Karafuto). Then came "aliens" (外国人 gaikokujin), broken down by, for example, Republic of China (中華民国 Ch&$363;ka Minkoku), followed by many other countries. From 29 August 1910, when Korea was incorporated into Japan as Chosen, the Residency-General of Korea became the Government-General of Chosen. Over the next three decades, GGC introduced Interior registration rules in order to make Chosen's family registers more those the prefectures. Family law was at the heart of civil status in Japan, and family registers were the principle instruments by which the state and local polities enforced national and local laws and ordinances to carry out their governmental missions. Registers played the name role in the nationalization of Korea as Chosen in 1910 as they had in all territories Japan had previously incorporated into its sovereign empire -- from Ezo (Hokkaido) in 1869, Ryukyu (Okinawa) in 1872, Ogasawara in 1875, the Kuriles (and some extent natives of Karafuto) in 1875, Formosa (Taiwan) in 1895, and Karafuto in 1905. The Republic of Korea, founded on 15 August 1948, was the next to last East Asian state to formally adopt a principle of ambilineality in its nationality law. Not until 1998 did ROK revise its 1948 Nationality Act to enable a child to acquire ROK's nationality at time of birth if either of its parents was a national. Until then, the Nationality Act had been, like many of ROK's laws, a bastion of patriarchy. The Republic of China did not adopt ambilineality until 2000. ROK was not exceptional in its adoption of a patrilineal right-of-blood principle in 1948. The principle had been, and was then still, the most common nationality standard in the world. Only during the second half of the 20th century did most states, having ratified the Convention on the Elimination of All Forms of Discrimination Against Women (CEDAW), begin to adopt ambiliniality. By the time ROK was founded in 1948, its provisional government had already reversed many of the changes the Government-General of Chosen had imposed on Korean family law, in particular provisions for use of the same family name in a register as opposed to different surnames, and Japan's more permissive rules about marriage and adoption. However, ROK adopted a Family Register Law that continued to essentially enforce the same concept of population registration as a tool for bureaucratic control. After considerable pressure for more liberal rules concerning marriage and other family matters, ROK has more recently revised its laws to permit, for example, marriages between people with surnames of the same clan -- though Korean individuals and families are free to follow customary practices of avoiding same-clan surname marriages. I copped and compressed the above images (click to enlarge) from the blog of someone called dreamtale. I do not otherwise know their provenance. As early as February 1909, the government of the Empire of Korea, and the Residency-General of Korea representing the government of Japan in Korea, were initiating the the imperial sanctioning and promulgation of the Population Register Law. The law was sanctioned and promulgated by the Emperor of Korea on 4 March 1909 and signed by Korea's Prime Minister of the Cabinet, Minister of Interior, and Minister of Justice. The new law was published in Korea's Official Gazette (官報 Kwanbo) on 6 March 1909 (Kwanbo, Number 4318, pages 17-18, see images to the right). A supplementary provision stipulated that the law would come into effect from 1 April 1909. Another supplementary provision stipulated the Interior [Home] Department would determine enforcement rules. The Interior Department issued Population Register Law Enforcement Regulations in a directive dated 22 March 1909. The Korean and Japanese texts of both the law and regulations are shown below, with my structural translations and commentary. The Korean text is my adaptation from an electronic version posted on the website of the Kyujanggak Institute For Korean Studies at Seoul National University. I converted standard hangul and non-JIS hanja into Unicode. Seven non-standard hangul I was unable to encode are highlighted here as H1 to H7, numbered in the order of their appearance. I have vetted the Korean text against the text of the law as published in the Kwanbo or Official Gazette" of the Empire of Korea, using images found on a blog, which also shows a Japanese version (see next). The Japanese text is something I created by editing the Korean text into the Japanese versions as represented in Japanese materials I obtained from the Japan Center for Asian Historical Records (JACAR) (アジア歴史資料センター Ajia Rekishi Shiryō Sentaa) [Asia history materials center] at the National Archives of Japan (NAJ) (国立公文書館 Kokuritsu Kōbunsho Kan) [National public document repository]. I have added a comma or two that seems to have been intended but dropped, and noted a couple of inconsistencies in kana usage, in red highlighting. The structural English translation is mine. I have chosen to translate the Japanese rather than the Korean version because I am unable to represent the older hangul and am not familiar with historical hangul orthography (though at the phrasal level the Korean expressions are clear). See more about the linguistic and graphic characteristics of the two versions under "Note on linguistic characteristics" in the "Sources" section below. I have highlighted in green the terms on which I have glossed in boxed commentary following my translations. See Sources below for full particulars on the Japanese materials used to confirm both the Korean and Japanese texts of the 1909 population law and enforcement regulations, and for comments on Korean texts were treated in Japanese materials. I [the emperor] sanction the Population Register Law and herein distribute [promulgate] it. Yi Wang Yong (李完用 1958-1926) advocated that Korea be developed like Japan and this led him, as the Education Minister, to promote and sign the 1905 treaty under which Korea became a diplomatic protectorship of Japan. Yi became Korea's Prime Minister in 1906, and as such he also signed both the 1907 treaty which allowed Japan to play a direct role in Korea's domestic legal reforms, and the 1910 treaty that joined (annexed) Korea to Japan. He heads the list of "collaborators" compiled by the government of the Republic of Korea under a 2005 law which allows the state to return to its ownership property of "pro-Japan anti-[racioethnic]-nation actors" (친일반민족행위자 ch'inil panminjok haengwija 親日反民族行為者). Pak Che Sun (朴齊純 1858-1916 Park Che Soon) signed the 1905 diplomatic protectorship treaty as Foreign Affairs Minister, and he too is on ROK's collaborator list. Ko Yŏng Hŭi (高永喜 1849-1916 Ko Young Hee) was also one of the several young Korean officials who, after the Japan-Chosen amity treaty of 1876, was sent to Japan to observe its development, and he advocated a similar path for Korea. Over the next three decades Ko spent more time in Japan, including a stint in 1903 as Korea's minister extraordinary and plenipotentiary to Japan. He, too, is officially regarded as a traitor and collaborator in ROK. After Korea joined Japan as Chosen, all three of the above officials, among many others, received titles as nobility under the Chosen Nobility Order (朝鮮貴族令 Chōsen kizoku rei), established in 1910 pursuant to Article 5 in the annexation treaty. In cases corresponding to any one of the items to the left [the following items], within ten days from the day of the occurrence of the matter, [the matter] should [must] be declared [reported] to the head of the town with jurisdiction [over] the principle register place [locality, address]. However, when it has not been possible to know the occurrence of the matter, calculation will be from the day the matter was known. When a matter in the preceding paragraph involves two or more town jurisdictions, [the declarant / reporter] should make copies of the declaration [report document] for each [jurisdiction], and declare [the matter] to the head of the town with jurisdiction over the place [locality] in which the person with the duty to declare is [exists, lives, resides]. The character of Korea's population registers as affiliated with the local polity with jurisdiction had been the foundation of customary determinations of Korean subjecthood or nationality. This quality of local quality affiliation became the foundation for considerations of affiliation with Chosen when Korea was annexed to Japan in 1910. The Population Register Law, in conjunction with customary family law, continued to define what had been "Korean" nationality and what, after the annexation, became "Chosenese" regionality within "Japanese" nationality. It is extremely important to understand that a register was affiliated with the polity that had jurisdiction over its address, and hence anyone who was a member of the register as a matter of record was affiliated with the local polity, and with larger provincial and national polities within which the local polity was nested. In the prefectures of Japan, and in Taiwan and Karafuto as parts of Japan's sovereign dominion, family registers were also under municipal (village, town, city) jurisdiction, and municipalities were nested with larger (district, provincial, prefectural) polities, that were in turn nested with regional (Interior, Taiwan, Karafuto) polities, and ultimately with Japan's national polity. If part of a municipality was transferred to the jurisdiction of another prefecture or province because of a formal shift of a border, then the registers associated with the addresses in the transferred area went with the area. This was also true when smaller municipalities merged together, or were incorporated into (annexed by) another municipality -- i.e., the registers, and the affiliates of the people in the registers, went with the territory. This is essentially what happened when Korea was annexed by (incorporated into) Japan in 1910. It joined Japan's sovereign dominion, and in doing so the people in its affiliated registers became subjects and nationals of Japan. When the annexation was provisionally reversed pursuant to the provisions of the instruments of surrender in 1945, Chosenese retained their Japanese nationality because in principle the peninsula had not yet been separated from Japan by a treaty. They lost their nationality, in Japan's legal view, pursuant to the effects of the 1952 San Francisco Peace Treaty, which confirmed the separation stipulated in the 1945 surrender instrument. Similar principles of affiliation based on territorial jurisdiction determined the status of Okinawans during the period that Okinawa was under the legal administration of the United States. Japan retained residual sovereignty over Okinawa, and Okinawans retained residual Japanese nationality. But since Okinawa was not under Japan's legal control and jurisdiction, Okinawans were not regarded as being Japanese nationals. Now and again in Japan today -- and sometimes in waves of merger mania -- municipal borders shift, and entire municipalities disappear in urbanization movements. The same principles determine the affiliation of all people domiciled today in a Japanese municipal register, whether Japanese or alien. Nationality continues to be linked with honseki (principle register) status, hence those with honseki in Japan are Japanese, while anyone with a honseki outside Japan is an alien with a nationality (whether or not the nationality exists or is recognized), and anyone with no honseki is a stateless alien. All of the items on the above list reflect the operations of contemporary statue and customary family law in Korea. The first several items constitute what would be called "status acts" (身分行為) in the sense such acts or events affect the status of one's existence -- birth and death marking the beginning and end of one's existence in this world, and marriage, divorce, and adoption and the like effecting the one's existence in relation to the existence of others. Of particular interest here is Item 15, Changing [personal] name (改名 K. kaemyŏ, J. kaimei). Korean family law provided for surnames and personal names (姓名 K. sŏmyŏng, J. seimei), and it was customary in Korea to adopt a new personal name when coming of age. The object of the Population Register Law was to make sure that such name changes were duly reflected in registers, as registers were intended to define people in terms of their legal existence both as individuals and as members of families. Some people may be tempted to see the name-change item as a precursor to the notoriously misunderstood "create family name, change personal name" decrees issued by the Government-General of Chosen in 1939 -- but this is not the case. The intent item here was clearly to put Korean customs on a legal footing. In Japan also it was fairly common, at the time Japan's first nationwide Family Registration Law was promulgated in 1871, for young men of samurai standing to assume new names before or after coming of age. It is difficult to name a leader of the Meiji Restoration in 1868 who had not experienced name changes, either as a result of adoption, or in relation to coming of age or other points in one's personal life. Japan's civil code and subordinate family registration law allows family courts to permit name changes if the court recognizes due cause. Precedents include changing sexually ambiguous names, or names that invite ridicule or discrimination. Some courts have also permitted the adoption or restoration of a name lost in the process of naturalization. Name is also possible under registration laws in the Republic of Korea, where due cause includes the adoption of a Korea-esque personal name in lieu of a Japan-esque personal name. See Sources below for more about names on forms related to the Population Register Law. Persons with duty of declaration under Article 1 are as to the left [as follows]. In the cases of the preceding paragraph, when the head of household is unable to carry out the declaration, the person who ought to be the presider in lieu of the head of household; when there is no presider, a family member or relative; when there is no family member or relative, the person who manages the place or building et cetera [where] the matter occurs; or a neighboring family, should effect this [declaration]. Declarations of marriage, divorce, adoption and ending adoption should be effected with the joint signatures of the actual families. However when it is not possible to obtain joint signatures the reason should be noted on the declaration. In cases [when] the person with the duty of declaration under Article 2 resides in [a locality] other than the principle register locality, [the person] can declare to the village head with jurisdiction over the residence locality. Declarations concerning population registers are to be effected in writing. However, for the present they may be made orally. A person who neglects [fails] [to make] the declaration of Article 1 will be punished with lashing of up to 50 [lashes] or a fine of up to 5 hwan [J. yen]. However, a person who effects a fraudulent declaration will be punished penal servitude of up to six months and lashing or a fine of up to 100 hwan. Punishment by lashing in Japanese and Korean law (笞刑 J. chikei, K. t'aehyŏng) was inspired by Chinese penal codes. Lashing continued to be practiced in Japan until 1876, and in Korea and then Chosen into the second decade of the 20th century. For examples of lashing in Tokyo and other ordinances in Japan during the early 1870s, see "Punishments" in Tokyo's Ishiki kaii jorei: Policing public order, safety, hygiene, and morality in the 1870s on this website. For an example of lashing in Chosen on a popular postcard with a 1913 frank, see The empire of postcards: "Customs" of places and peoples in "The Detritus of Empire" feature of this website. Thomas David Dubois writes this about lashing in the Empire of Japan (Inauthentic Sovereignty: Law and Legal Institutions in Manchukuo, The Journal of Asian Studies, Volume 69, Number 3, August 2010, page 757, underscoring mine). Certain significant differences did separated the codified law of Japan and Manchukuo, and many of these differences had a distinctly developmental character. Among the most characteristic of these was the selective use of corporal punishment, particularly flogging. Such punishment had a complicated history in the Japanese empire. As part of the drive to end foreign extraterritoriality, Japan had banned the use of corporal punishment on its own soil in 1872 (Botsman 2005, 151, 211-20). However, having gained possession of Taiwan and Korea, it retained and even increased the use of flogging overseas. The use of corporal punishment continued, amid vocal criticism over the use of "barbaric" punishments abroad, until unrest in both colonies during the late 1910s prompted a general softening of military-style rule and a shift toward the cultural "imperialization" policy (Katz 2005, 193-213). Thus, it is something of a surprise to see corporal punishment not only continued in the leased Kwantung territory but also instituted afresh in Manchukuo. Dubois's article is on the whole very concise and clear, in addition to being informative and interesting. However, some of his characterizations require correction or nuancing. From 1895 to 1919, the Government-General of Taiwan was headed by a military officer. GGT, established in May 1895, shifted to a military administration, meaning that Taiwan was essentially under martial law, to facilitate the need of the new government to suppress anti-Japanese rebellions in some localities. However, GGT shifted to a nominally civil administration from 1 April 1896, the first day of the fiscal year of Meiji 29. 1 April 1896 is the datum for the start of Japan's systematic compilation of many kinds of statistics regarding Taiwan, which were vital to Japan's style of social and industrial development. Such compilation became possible only because, by this time, sufficient control and jurisdiction had been established to introduce Japanese-style bureaucratic overseeing of local affairs. GGT, while introducing Japanese-style policing and judicial institutions, continued to enforce most local statutes and customary laws, until which time elements of Interior (prefectural) laws and regulations could be introduced into Taiwan's legal system. The Residency-General of Korea, established in 1905 and in operation from 1906, oversaw Korea's defense and diplomacy, and from 1907 an increasing amount of its domestic affairs, until Korea was annexed as Chosen in 1910. From this point, the Government-General of Chosen oversaw practically all normal matters of civilian government in Chosen. Military forces, or military-like police forces, did not characterize the overall government of either Korea or Chosen. Many writers describe Japan's rule of Taiwan and Chosen as having been been militaristic. This image is easily bolstered by portraits of earlier governor-generals in formal military dress ablaze with emblems of rank and decorations. The image is also encouraged by photographs and drawings of uniformed military personnel, gendarmes, and police on duty in these territories. Yet even in the early decades of Japan's rule of Taiwan and Chosen, when the governor-generals were mostly military officers, the missions of their governments were more like that of the General Headquarters of the Supreme Commander for the Allowed Powers in Occupied Japan. GHQ/SCAP functioned as a parallel government to the government of Japan, which had delegated its sovereignty to SCAP. That Douglas MacArthur and the chiefs of most GHQ sections (comparable to ministries) were military officers was secondary to their mission as ministers over civilian matters. Japan gained legal control and jurisdiction in the Kwantung Leased Territory in 1905 as part of the settlement to the Russo-Japanese War. The Liaotung peninsula had been ceded to Japan, along with Taiwan, in 1895 as part of the settlement to the Sino-Japanese War, but Japan was forced to retrocede the peninsula to China, which then leased it to Russia. The Kwantung Least Territory was part of Japan's legal empire but not part of its sovereign empire. Japan continued to apply mostly local rules to local people in both criminal and civil matters, in accordance with its 1918 Common Law, which determined applicable laws within both the smaller sovereign and larger legal empire. Manchoukuo (Manchukuo) was not part of Japan's legal empire, much less its sovereign empire. Nor does Dubois claim that it was. However, why should it be surprising that a number of penal practices still customary in the region continued to inspire Manchoukuo's penal code? As Dubois writes, Manchoukuo's judicial institutions were heavily influenced by those in Japan, to the extent that they were overseen by Japan-trained Manchoukuo judges if not also by Japanese judges. But the adoption of judicial procedures similar to those in Japan did not oblige the adoption of Japan's definitions of offenses or its provisions for punishment. Notifications pursuant to this law, in localities without a village head, should be made to a person who is equivalent to a village head, and in Hansŏng province should be made to the police headquarters with jurisdiction. Hansŏng province reflects 漢城府, the capital province of Korea. The urban area had also been known as Hanyang (漢陽 J. Kan'yō), and was soon to become Keijō (京城 Kyŏsŏng), better outside Korea and Chosen as "Seoul" if not "Soul". Rules required for enforcement of this law shall be determined by the Minister of the Interior [Home] Department. This law shall be enforced from the 1st day of the 4th month of the 3rd year of Yunghŭi [1 April 1909]. The Population [door-mouth] Survey Regulations, Imperial Ordinance No. 61 of the 1st year of Kŏn'yang [1896 -- ], shall be abolished [abrogated] from the day of enforcement of this law. Kŏn'yang (建陽) -- literally "constructing [establishing] sun" -- was the next to the last reign name of the Yi dynasty. It was adopted the year before Chosŏn (朝鮮) became the Empire of Korea or Great Han (韓) Empire. The significance of the reign name is that the Yi government declared the 17th day of the 11th month of its Chinese lunar calendar, which fell on 1 January 1896, to be the 1st day of the 1st month of the 1st year of the new reign, as from this day it officially began using the solar calendar. Japan had officially switched to the Gregorian calendar from 1 January 1873, by jumping from Meiji 5-12-2 (31 December 1872) to Meiji 6-1-1. The Japanese text reflects a transcription in present-day graphs with katakana and punctuation, which I cut and pasted from the "dreamtale" blog (see note above), then slightly reformatted and corrected. See Population Register Law (above). For the purpose of recording particulars concerning population registers, [provincial] police departments, police branch departments [precincts within provincial departments], and constable-resident-places [local substations within precincts, at which a police officer resided] shall keep [maintain] population register records. As for what [the family records] [officials] have removed [struck] from population register records due [pursuant] to the occurrence of a matter in each item [the items] of Article 1 of the Population Register Law, the town (面 myŏ) shall separately compile and bound [them] [and] regard [them] as removed [struck] registration records. On population registers, [registrars] are to put the name of the lot and the number of the household. The order of population registration recordings shall be as to the left [as follows]. A mistress shall be equivalent to [be recorded in the same manner as] a wife. In the case of finding an abandoned child, [the registration] should be treated as the establishment of [by establishing] a [new] family. However, when there is someone who would adopt [accept and foster] [the child] as an adopted [fostered] child, [police] are to effect treatment [as that] of an adopted child on top of [in addition to] establishing a [new] family; or when there is a supporter [someone who will assist and foster (the child)] [then] [the child's register] is to be treated as an attached register [register attached to the supporter's register]. This provision, for "finding an abandoned child" (棄兒発見), is particularly interesting because, in the case of a foundling infant, it would reflect one of the two jus soli (place-of-birth) principles in Japan's 1899 Nationality Law (Article 4). China adopted similar principles in its 1909 nationality regulations. Japan's 1899 law stipulated that "When the father and the mother of a child (子) born in Japan are unknown or do not possess a nationality the child (子) will be a Japanese" (日本人 Nihonjin)." China's 1909 regulations provided that "A person who, if [when] the father and mother equally [both] cannot be verified or have no nationality and [but] was born in China's territory, shall also be affiliated with China's nationality. An abandoned child (發現之棄童) whose place of birth together [both] cannot be verified and [but] [the child] is found in China's territory shall be the same [be similarly regarded as affiliated with China's nationality]." While the provision as stated in Korea's 1909 regulations says nothing about whether the parents of the child are known, I would assume it meant that neither parent was known. I have not yet been able to determine whether a similar rule was followed in earlier Korean registration practices. In a case in which a family has ceased to exist, it shall be removed from the registry recording the reasons [for its extinction]. The population register of an attached-registrant should be compiled as a separate sheet for each family clan and be bound at the end of the population register of the head of the attached-register. To the population register of the attached-registrant should be recorded in the margin the name [surname and personal name] of the head of the attached-register and the purport [purpose] of the attached-register. The village head should always be alert to population register changes within [his] department [jurisdiction], and when there is a person who neglects [fails] [to make] a declaration [he] should make a notification [warning] [to do so]. The village head should collect the declarations of Article 1 of the Population Register Law, and by the 15th day of the month following the month [in which the declarations are made] [he] should send [them] to the police headquarters with jurisdiction. Among declarations that have been received by a police headquarters, those related to other administrations [jurisdictions] should be sent to the headquarters with jurisdiction. [Police headquarters] should prepare population register records in accordance with Form A, and Oral Declarations in accordance with Form B. Within three months after the new registration law came into force, a 1907 estimate of Korea's population was revised using information from a mid-June 1909 survey. The first census conducted under the new law was completed by May 1910. Shortly after the Population Register Law was enforced, the Police Advisory Board augmented 1907 household and head counts with records compiled as of 15 June 1909. The population figures introduced here are from the following source, scans of which are available on the Japan Center for Asian Historical Records (JACAR) (アジア歴史資料センター Ajia Rekishi Shiryō Sentaa) [Asia history materials center] at the National Archives of Japan (NAJ) (国立公文書館 Kokuritsu Kōbunsho Kan) [National public document repository]. The above publication is represented as having come by way of the Ministry of Foreign Affairs. Images include a cover with the titling as shown. Inside the cover is a brief undated preface. The main body of the report consists of 28 numbered pages of tables showing population breakdowns by police stations within police precincts within provincial police department jurisdictions. There is a blank back cover but no colophon. 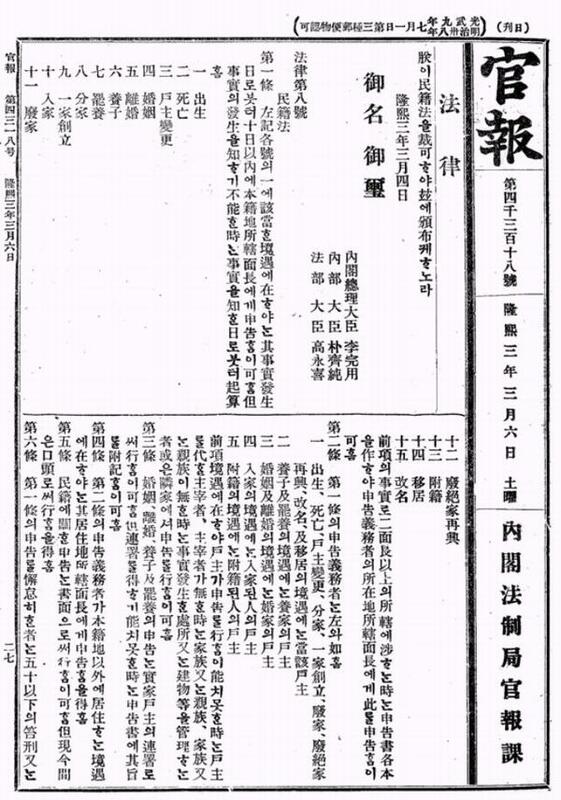 According to the preface, the figures in the tables were based on households (戸口) surveyed in 1907 (Kwangmu 11) by the Former Police Advisory Department [Board], corrected with data compiled as of 15 June 1909 by police at stations in precincts in the jurisdiction of the Metropolitan Police Agency (警視庁) [headquarters department] and in the jurisdictions and 23 provincial (道) police departments. The 1909 survey was conducted by police pursuant to the Population Register Law enforced from 1 April 1909. The figures are broken down by number of households (戸数) [number of doors] and people (人口) [people's mouths] by three statuses -- Korean (韓人 Kanjin), Japanese (日本人 Nihonjin), and Other aliens (其他外国人 Sono hoka no gaikokujin). The use of "Korean" and "Japanese" reflects the fact that at the time (1907 and 1909), Korea had not joined (been annexed to) Japan as Chosen, and Koreans had not yet become Japanese of Chosenese "minseki" (population register) status. Japanese are therefore "aliens" in Korea -- though of somewhat different status than "Other aliens" since the Empire of Korea had formally become a protectorship of the Empire of Japan in 1905. The People/Household ratios and Totals are my mine. It took the Empire of Korea a few months longer than expected to conduct the first census under the new registration law. The survey planned for completion by the end of 1909 could not be finished until May 1910. The tally of aliens in Korea, however, appears to have been completed on schedule. There are full accounts of the two surveys in Japanese and Korean versions of the annual reports begun by the Residency-General of Korea and continued by the Government-General of Chosen. Here I have cited the full description of the 1909-1910 census as reported in the English version. See Korea, Chosen, and Tyosen reports for details on this series of reports. The census of the "Native Population" as of 10 May 1910, and the count of aliens as of the end of 1909, are described as follows (pages 15-17, [bracketed] clarifications and underscoring mine). Thus the total population of Korea, according to the new census taken in May, 1910, amounts to 12,934,282 and the total of dwelling houses to 2,742,263. Compared with the census taken in 1907 by the "Advisory Police Board," there is an increase of 3,178,309 in population and of 408,351 in dwellings. Such a difference is due chiefly to the fact that the census taken in 1907 did not include the whole of the population and dwellings in the extreme interior of the northern provinces and also in small islands where the police authorities had little opportunity to investigate. In the taking of the new census, 49,888 yen was spent in 1909 and 3,000 yen in 1910, thus making a total of 52,888 yen. After the completion of the new census, each police station was provided with registration books for population and dwellings in its jurisdictional district. Inhabitants are required to report to their Village Head-man as to their occupation, status, movements and change of residence, verbally or in writing (in the case of the city of Seoul the inhabitants are required to report direct to Police Stations); and the Headmen are required to transmit within fifteen days all such reports for each month to the Police Station concerned. Based on the reports submitted, the police authorities review the census registers every five years. Because the above report was published after the annexation, it was issued as a compilation of Government-General of Chosen. However, the report concerns mostly matters before the annexation, and hence makes attempts to make clear terminological distinctions between pre- and post- annexation usage. The Japanese population appears to be sexually fairly well balanced. However, a note in the Japanese edition of this report, published in March 1911, states in an overview of "Korea's population registration affairs [administration]" (韓国の民籍事務 Kankoku no minseki jimu), that "Japanese military personnel stationed in Korea are not included in the numbers of Japanese" (pages 22-23). The Chinese population is predominantly male. The American, British, and German populations have nearly as many females as males. The French population is largely male, there are more Australian and Canadian women than men. The above statistics, concerning population surveys taken before 29 August 1910, when Korea was annexed to Japan as Chosen, reflect the following terms in Japanese reports (romanizations and translations mine). Statistics published after the annexation reflect the fact that Korea had become Chosen and Koreans had become Chosenese. Since Chosenese were now Japanese, "Japanese" formally embraced all people in population registers affiliated with parts of Japan's sovereign dominion -- Interiorites (prefectural affiliates), Taiwanese (Taiwan affiliates), Karafutoans (Karafuto affiliates), and Chosenese (Chosen affiliates). Interiorites were generally listed first in demographic and vital statistics related to Chosen. There is considerable variation in usage in official English reports, some of which speak of "Koreans" and "Japanese" long after Japanese reports were consistently speaking only of "Chosenese" and "Interiorites". In other ways, too, the "Empire of Japan" is apt to be seen differently through English than in Japanese. Today, many Japanese writers, while referring to affiliates of Chosen as "Chosenese" (朝鮮人 Chōsenjin), refer to affiliates of the Interior as "Japanese" (日本人 Nihonjin). Many Korean writers, especially in the Republic of Korea, prefer "Koreans" (韓国人 Kankokujin) to "Chosenese". For more about how statistics were reported by the Residency-General of Korea (RGK) and the Government-General of Chosen (GGC) before and after the annexation, in Japanese, see the "Korea and Chosen publications" section of Chosen: The legal integration of Korea. For more about how statistics were reported in English versions of RGK and GGC reports, and in other English publicity materials, see "Korea, Chosen, and Tyosen reports" in The Empire in English feature of this website. The following two sources are useful guides to the Empire of Korea's 1909 Population Register Law and its early enforcement. The particulars shown below are based on my own examination of information and images of scans provided through the website of Japan Center for Asian Historical Records (JACAR) (アジア歴史資料センター Ajia Rekishi Shiryō Sentaa) [Asia history materials center], which is part of the National Archives of Japan (NAJ) (国立公文書館 Kokuritsu Kōbunsho Kan) [National public document repository]. The above publication is represented as having been among materials from the Government-General of Chosen (朝鮮総督府). The Central Council (中枢院 Chūsūin) was established from 1 October 1910 by an imperial edict promulgated on 30 September (Edict No. 355 of 1910) as GGC's advisory body. As such it was comparable with the Privy Council (枢密院 Sūmitsuin), which advised the emperor and government of the Empire of Japan. Formally, GGC's authority derived directly from the emperor through the prime minister of the cabinet. GGC decrees, sanctioned by the emperor, had the force of diet-enacted laws. From 1913, while continuing to function as Chosen's government, GGC was also loosely tethered to the overseeing of the Interior [Home] Affairs Ministry. This source, Volume 10 (第十編) of several volumes, covers police (警察) and hygiene (衛生) in the following eight chapters. Chapter 1 (pages 1961-1975) is divided into two parts, one on the Population Register Law, the other on the Population Register Law Enforcement Regulations. The part on enforcement has a section on Population Registration Records as physical forms, and a section on Population Registration Entry Rules or procedures for completing forms. The sections on records and rules include examples of register forms. All of the above materials are in Korean consisting of hanja and hangul. The Korean texts are translated with katakana and kanji on the right and kaeriten on the left. Most of the hanja remain untranslated because the same graphs were used in Japanese. Hangul postpositions and conjugations also have regular and predictable Japanese translations. The Korean texts and the corresponding Japanese glosses are extremely concise and clear, as was typical of legal writing. Even without the running kana and kanji glosses and the occasional kaeriten, anyone literate in Japanese, even though not knowing Korean, would have been able to make sense of the Korean. The Japanese texts closely mirror both the words and phrases of the Korean texts, as one would expect of two languages that are structurally almost identical and drink from similar reservoirs of Sinific expression. The most conspicuous differences reflect the preference of Korean legal usage at the time for more Sinific expressions, while Japanese usage preferred briefer but no less precise expressions. Japan had for centuries heavily Japanized its used of Chinese, and from the Meiji period had abandoned even its Japanized Chinese in favor of Japanese, and Japanese legal usage had continued to be simplified though not to the point of vernacularization. Korea, though, had continued to use Chinese in many of its treaties and laws until the final decade of the 19th century. The above materials, apparently gathered together by NPA in 2001, are represented as having been among materials from the Interior [Home] Affairs Ministry (内務省), which oversaw police in the Interior (prefectures) of the Empire of Japan before the end of World War II. Many police-related documents from the former Interior Ministry are in NPA's archives. The table of contents lists eight separately paginated items, beginning with statistics on police in the Empire of Korea. Among these eight items, the following three are of interest here. Between the table of contents, and the beginning of the first item on police statistics, are three genealogical charts defining direct and collateral kinship relationships. The first chart concerns Korea. The second chart compares Korea with Roman civil law, temple (canon) law, and present-day Japanese law. The third chart shows Korean terms with French equivalents. Charts of this kind can be found in all countries, in law books concerning family law. On the wall by the door to his office, my father, for many years, had a large chart showing all the relationships an attorney needed to know when dealing with inheritance issues. This item consists of a cover and two sections, each with six leaves of twelve numbered pages. The cover sheet attributes the (民籍法ノ説明 Minsekihō no setsumei) to the Police Bureau of the Interior [Home Affairs] Department (内部警察局 Naibu Keisatsu Kyoku) of the Empire of Korea. It also notes that the enforcement regulations are attached. The item is entirely in Japanese of the style commonly found in official documents at the time, meaning that there are no periods, and a few commas only in a couple of in-line lists. I have vetted the transcriptions of the law and enforcement regulations, as shown on this page (see above), against the versions in this item. The first section (12 pages) consists of the Population Register Law and point-by-point explanations. Each of the matters that are covered by the law in the items listed in Article 1 are discussed at length in terms of Korean family law. 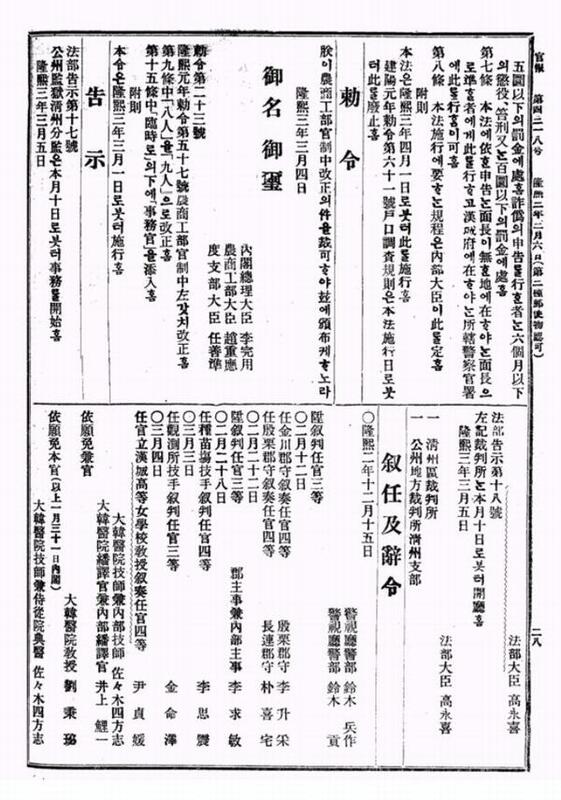 The second section (12 pages) begins with the enforcement regulations, then shows the Population Registration Record (民籍簿 Minsekibo) form with procedural rules for making entries on the form, and the Oral Declaration (口頭申告書 Kōtō Shinkokusho) form which an official would complete based on details orally provided the declarant. The declaration provides for writing a date in the form 隆煕 年 月 日 -- i.e., the year, month, and day under the then-current reign name "Yunghŭi" (隆煕 J. Ryūki). The forms are printed documents, modeled after forms used for family registers in Japan, but adapted for Korea's family laws. Of particular interest here is the provision of a space for each person's 姓名 (K. sŏmyŏng, J. seimei) meaning "surname" (姓) and "personal name" (名) -- rather than 氏名 (K. ssimyŏ, J. shimei), the term used in Japanese law for "family name" (氏 shi) and "personal name" (名 J. mei). There is also a box for the 本 (K. pon, J. hon) or clan affiliation of each person's surname. This information was vital to the customary prohibition of marriage between people with same surname, but especially of the same clan of surname, and the preference for male heirs of the same surname clan.